Falsetto: Some male singers can begin to produce falsetto with a certain amount of ease at the beginning at the first register point; it is even possible for male falsettists to develop the timbre downward, nearly to the lower end of the normal chest range. Further, most untrained singers can no longer resist resorting to falsetto when they reach the second register point. In the eighteenth century, Tosi spoke of chest voice (voce de petto), head voice (voce di testa) and falsetto, while Mancini seems to designate only two registers, chest and head, the latter also called falsetto. The question is complicated by our knowledge that eighteenth pedagogical interest was still largely directed towards the castrati. Pertinent questions are (1) did falsetto mean, in former centuries, the imitative female sound it indicated in Italy today; (2) was this imitative female sound an accepted stylistic practice prior to the late nineteenth century; (3) did falsetto designate what is currently called "middle voice" (Voce intermedia); and (4) is voce de testa, as commonly practiced in the current Italian School, equivalent with what falsetto may have meant in previous centuries? The answers supplied to these questions determine the pedagogical assumptions upon which teachers build registration techniques. The waters are muddled still further by Garcia's interesting use of the term registso di falsetto-testa, with charts designating the falsetto register as lying between petto and testa registers. Indeed, Garcia breaks down his falsetto-testa register to specifically indicate that falsetto corresponds to the medium male vocal register. This is the area which the Italian School today treats as the zone intermedia, where register blending is important but where none of the sounds of falsetto (as understood in the current Italian School) would ever make an appearance. Further complicating matters, Garcia offers a chart showing that falsetto can commence at d (middle line, bass clef) in the male voice, and that the entire extent of falsetto in the female reaches about a fifth, from the pitch a (second ledger line below the treble clef) to c# (third space, treble clef), an area extending from the chest voice through the conclusion of lower-middle voice, for most sopranos. Clearly, Garcia cannot be brought forward in support of current falsetto practice. Francesco Lamperti does not help us much more with his designation of two registers in the male voice consisting of chest voice and mixed voice. He offers a chart with six overlapping notes; the reader could assume these notes are to be sung either in chest, in mixed voice, or in some further "mixture," of those two. It is surely more than a coincidence that F. Lamperti's mixed register and Garcia's falsetto registers occur within the areas generally designated today as the zone intermedia or zone di passaggio. It is clear that these two terms used by Garcia and Lamperti bear no correspondence to the practices of some contemporary teachers (none of them associated with the current Italian School) who devote much time to the development of falsetto. In the face of an on-going singing tradition, can one really believe that a little over a hundred years ago falsetto as it is understood in the Italian School was cultivated in the middle of the male singing voice? Regardless of what falsetto may have meant in the seventeenth and eighteenth centuries, it appears highly improbable that in the nineteenth-century Italian School (from which stem traditions which are vital to operatic performance today) the term falsetto universally meant the imitative female sound practiced in the late decade or two (often under the claim that bel canto has been rediscovered). 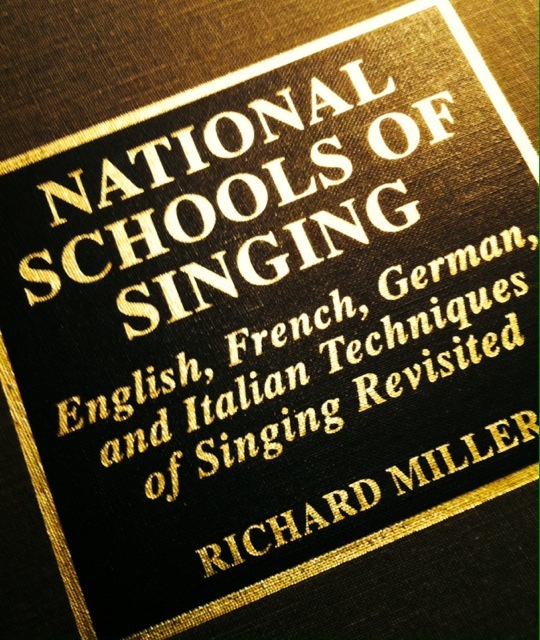 National Schools of Singing: English French, German, and Italian Techniques of Singing Revisisted by Richard Miller, Scarecrow Press, 1977, 104-106. There is much more to this passage, of course, which I encourage the reader to discover, if only to digest Richard Miller's logic which holds up nicely after thirty-seven years. Who is Miller addressing in his text? I can think of one person in particular, that being Cornelius L. Reid, who's understanding of falsetto and historical vocal pedagogy is radically different than Miller's. My own research agrees with Miller's conclusion insofar as García having antipathy for falsetto, both as a teaching tool in the studio and in performance. That he did allow it in one tenor aria on a high C is rather like a soprano singing in raw chest voice for dramatic effect: both are an exception to a rule.